Today, Carthage is a wealthy suburb of Tunis, its villas surrounded by gardens full of red hibiscus blossoms and purple bougainvillea. The scanty remains of the once mighty Phoenician city of Carthage lie scattered across the neighborhood. Despite their ruinous state, these UNESCO World Heritage Site remnants are one of the top things to do in Tunis and definitely worth a sightseeing trip from the central city to take in the atmosphere of a glorious, long-gone past and admire their beautiful setting backed by the sea. According to legend, Carthage was founded by the King of Tyre's daughter Elissa, after the king and his band of followers fled the Levant following a dispute over succession to the throne. In 814 BC, a Numidian prince granted Elissa, her father, and followers land from which the town of Qart Hadasht (known to the Romans as Carthago) sprung up. In antiquity, the Sebkha Ariana (salt lake) was still linked with the sea, so that Carthage lay at the end of an easily defensible peninsula, linked with the mainland only at its east end. It was enclosed by a wall more than 40 kilometers long, 10 meters thick, and up to 13 meters high, reinforced by towers, ditches, and earthworks, which protected the city and the surrounding agricultural area from enemy attack. A force of 20,000 infantry, 4,000 cavalry, and 300 elephants defended the city. Under the Magonid (Hannibal) dynasty, Carthage became the leading commercial power in the western Mediterranean; its seamen sailed around the whole of Africa and discovered the coasts of Britain. But its success led to conflict with the other Mediterranean power, Rome. The resulting three Punic Wars ended in the complete destruction of Carthage in 146 BC. The city was plundered, burned down, razed to the ground, and ploughed over, and the whole area was sprinkled with salt, so that even the soil should be made infertile. The area was later resettled by the Romans and named Colonia Julia Carthago. Soon afterwards, it became the seat of the provincial government. Thereafter, it grew and flourished, and by the early 2nd century AD, it was the third largest city in the Roman Empire, with a population of around 300,000. Magnificent public buildings were erected during this period, second only to those in Rome itself. As in Punic times, the central feature of the city was the hill of Byrsa, with the Capitol and the forum, and the Romans largely preserved the general layout of the Punic town. By the beginning of the 4th century, Carthage had become the leading city in Christian Africa and the see of a bishop. Under Byzantine rule, it retained its predominance in North Africa until the Arabs arrived and once again utterly destroyed the city in AD 692. Thereafter, Carthage fell into an oblivion, which ended only under the French protectorate and when the Catholic Mission, honoring the city's early Christian tradition, established its African headquarters in Carthage. Thought to be the place where the Phoenician princess Elissa landed in Tunisia, the Tophet is a religious sanctuary, where people worshipped the sun god Baal-Ammon. Excavations here have revealed that during the early days of the city, it was common practice to sacrifice first-born children here to make sure the city found favor with the gods. Although human sacrifice died out, the Tophet was used as a cult site of some sort right up to the Christian era. At the lowest level of all, the excavators discovered a small niche, the Chapel of Cintas, which may possibly have been the burial chapel of Elissa herself. The site is a maze of burial shafts and remains of foundations, with some of the numerous stelae bearing inscriptions and symbols. On the offer of a small tip, the custodian will open a shed containing numerous stelae, most of them with inscriptions, and pottery urns said to contain the ashes of the unfortunate sacrifice victims. 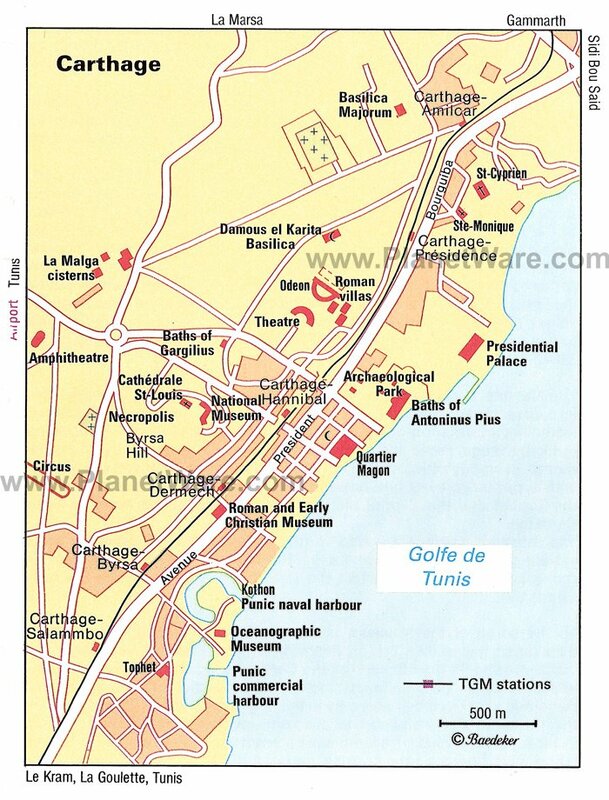 Behind the baths is the Archaeological Park, where the rectangular grid of streets clearly shows the layout of Roman Carthage's residential quarter. The park reflects the long history of Carthage, with Punic graves of the 6th and 5th centuries BC, the five-aisled Basilica of Douimès dating from the 6th century AD, and an underground burial chapel (the Chapelle Sainte-Monique) of the 7th century. All over the site are the remains of Roman cisterns, and under a tree are numbers of limestone "cannonballs," projectiles from Carthaginian arsenals. Northeast of the Archaeological Park, on a site formerly occupied by a 19th-century Bey's Palace, stands the well-guarded Presidential Palace. 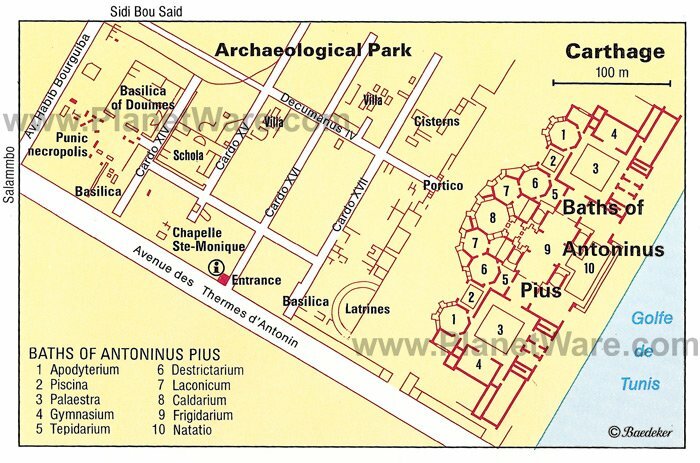 Behind the baths is the Archaeological Park, where the rectangular grid of streets clearly shows the layout of Roman Carthage's residential quarter. The park reflects the long history of Carthage, with Punic graves of the 6th and 5th centuries BC, the five-aisled Basilica of Douimès dating from the 6th century AD, and an underground burial chapel (the Chapelle Sainte-Monique) of the 7th century. All over the site are the remains of Roman cisterns, and under a tree are numbers of limestone "cannonballs", projectiles from Carthaginian arsenals. North-east of the Archaeological Park, on a site formerly occupied by a 19th century Bey's Palace, stands the well guarded Presidential Palace. Within the park is the National Archaeological Museum (Musée National de Carthage), which has a very interesting collection of material. Exhibits offer information about the course of the excavations; a model of Punic Carthage; Punic and Early Christian antiquities, jewelry, and ornaments; everyday objects; clay masks; little heads in colored glass paste with large staring eyes; funerary stelae; sarcophagi; mosaics; and models of the Tophet and the Capitol built by the Romans on the ruins of Punic Carthage. The museum gardens are an attraction also worth visiting. Amid the greenery are a variety of ancient remains and a three-meter-high marble statue commemorating Louis IX (though in fact the statue is a likeness of the Emperor Charles V). The Quarter Magon excavation site is in a small park near the Archaeological Park and is useful to visit to feel an impression of the development of the town in Punic times. Immediately behind the seawall (5th century BC), which just before the Third Punic War was 13 meters high, was the craftsmen's quarter. Beyond this were larger houses, and beyond these again, luxurious villas with richly patterned terrazzo floors. There is a small museum, with models of the Punic town walls, houses, and streets; pavement mosaics of the Punic period; and a model of the ancient quarries at El Haouaria. In the 5th century BC, the Carthaginians built workshops here, which later gave place to houses. After the destruction of Carthage, the hill remained unoccupied, and it was only in the reign of Roman Emperor Augustus that the summit of the hill was leveled off. It destroyed the Punic remains, which included a temple of Eshmun (Asklepios), and led to the construction of a huge forum and Capitol. This was the starting-point of the two main axes of Roman Carthage: the decumanus, running from east to west, and the cardo, from north to south. During excavations under the church and the monastery, various Roman remains were found, which are now displayed in the Bardo Museum. This hill was the central feature of the Punic settlement, and during the later Roman era, the Roman city builders sliced some six meters off the 70-meter summit in order to make a broader platform for their imperial buildings. Today, the hill is crowned by the Cathedral of Saint Louis, built in 1890 and dedicated to King Louis IX, who died here in 1270 during the siege of Tunis. From the summit, tourists can enjoy fine views across the entire Carthage area. The 2nd-century Roman theater is found on Avenue Reine Didon, built into a hillside facing the sea. There is seating for 5,000 spectators. The stage, slightly raised, is backed by a scenae frons (stage wall). Immediately adjoining the theater is the Park of the Roman Villas. Once a Punic cemetery (in which a number of shaft graves are still to be seen), the site was later occupied by the peristyle villas of wealthy Romans. One 3rd-century house, the Villa des Volières, has been restored. From the terrace, on which there are a number of fragments of sculpture, there is a fine view over Carthage, the Presidential Palace below, the Gulf of Tunis, and Cap Bon beyond. Just one kilometer northwest of Byrsa Hill is the 2nd-century Roman amphitheater, a five-story structure with seating for some 50,000 spectators and an arena that could be flooded for mock naval battles. Apart from its massive foundations and a few underground rooms, however, the whole structure has been destroyed. During the persecution of Christians in AD 202, St. Perpetua, her slave-girl Felicitas, and others were martyred here by being trampled to death by a wild cow. A marble column erected by the Pères Blancs commemorates them. St. Cyprian was beheaded here in AD 258, the first African bishop to be martyred, and St. Augustine lectured in the arena. On the opposite side of the street from the amphitheater, a footpath leads to the La Malga cisterns, built by the Romans to store water brought from the Zaghouan hills in an aqueduct 132-kilometers long. Only 15 of the original 24 cisterns are now left. Along Rue Hannibal lies the old Punic harbor, with two basins in which the mightiest fleet in the Mediterranean once laid at anchor. It's a sleepy, non-descript place now, but according to the ancient sources, the commercial harbor was in the shape of a rectangle measuring 456 meters by 356 meters, linked with the sea by a channel 20 meters wide. The naval harbor to the north, which was surrounded by a high wall, had a diameter of 325 meters. A channel giving it direct access to the sea was constructed only during the Third Punic War. The naval harbor alone had moorings for some 220 vessels, both along the landward side and around the island.